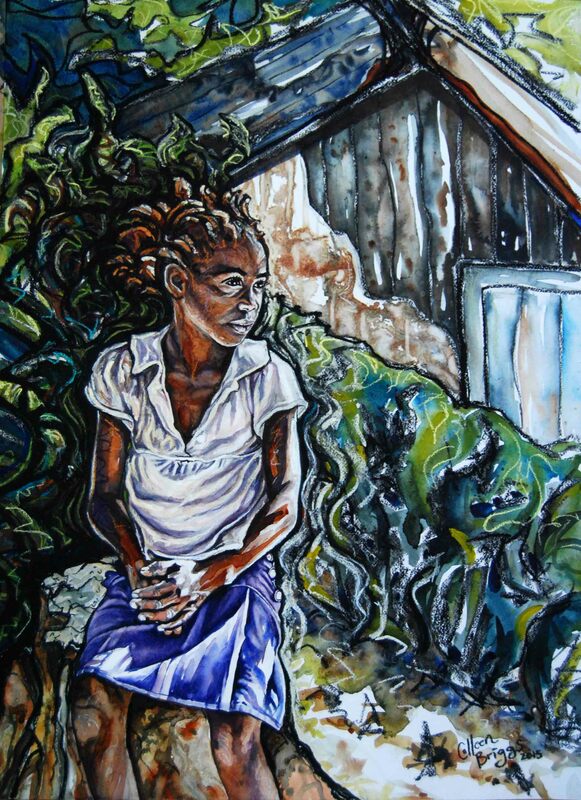 Orphan in Zimbabwe; 2015; 20″ x 28″; watercolor and pastel. Widows, the fatherless, and orphans can claim about 40 verses that command justice for them. The sheer volume of verses about these people groups convince me that how we treat them is of the utmost importance to God. The statistics are staggering, with more than 153 million orphans in the world. Why and how are children orphaned? Perhaps like Charles in Kenya, they are passed from aunt to uncle as each caregiver successively dies from AIDS, until one elder remains; and this uncle will soon die as well. Maybe like Sammy in Kenya, they are completely abandoned at birth to an institutional orphanage. The cause for abandonment, as for Yen in Vietnam, can often be traced to mental illness of parents or even complete societal break-down. Or perhaps, like Vanessa in Zimbabwe, they live under the oppression of a corrupt government that drives people into relentless cycles of poverty and death. Sometimes natural disasters, like the massive earthquakes in Haiti and Nepal, leave children the most vulnerable. And sometimes children are orphaned by political upheaval, as in Syria and Iraq. Whatever the cause, the hollowness in an orphan’s eyes transcends culture. I’ve looked these children in the eye in Vietnam, Nepal, and Kenya; and I cannot turn away. Their faces haunt me. Stubborn hope for them grabs hold of my heart. I paint, I pray, I cling to the God who will never stop loving them. On October 2, Shine Like Stars will open, a collection of some of my artwork expressing both grief and hope in my journey of loving orphans and also a collection of paintings by Sanctuary of Hope kids of Kenya. Recently, I created a piece about Zimbabwe to accompany works I have already painted about Vietnam, Nepal and Kenya – the four countries served by Hope’s Promise. Although I have never visited Zimbabwe personally, my dear friend, Lydia (last name withheld for her protection), serves as the Country Coordinator. Orphan; 2010; 19″ x 27″; mixed media: collagraph, pastel, charcoal. 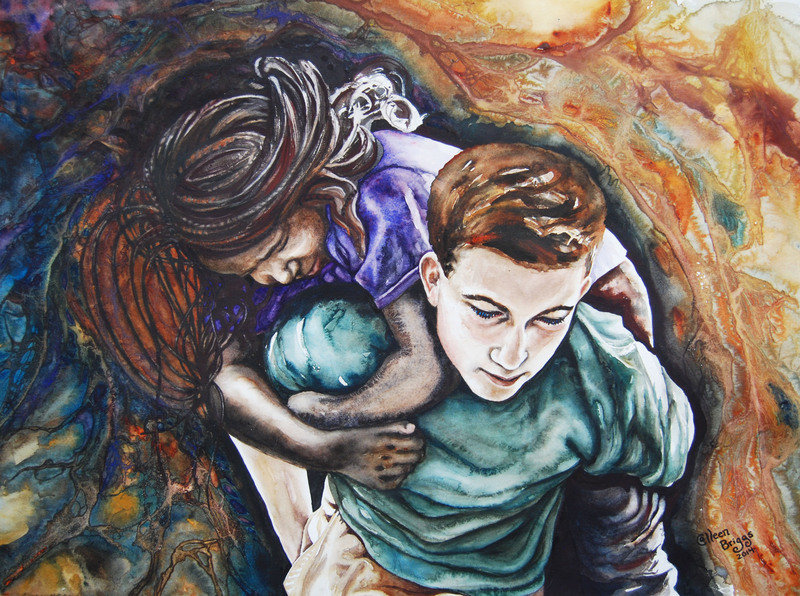 Orphans in Nepal; 2012, 21″ x 29″; mixed media: charcoal, pastel, watercolor. Sacrifical Love; 2013; 21 1/4″ x 28 3/4″; mixed media: charcoal, watercolor, pastel. Frail and fragile, she faces an insurmountable barrier of government corruption, disease, and poverty. She only knows she is hungry, grieving, and alone… but hoping. If we can reach her before that flicker of hope fades, perhaps like Vanessa, a Hope’s Promise Zimbabwe scholarship recipient, she will rise to lead us all. Immense sorrow permeated Vanessa’s childhood. She lost her parents at a young age and then two successive caregivers, an aunt and then an uncle. Yet, in 2014, Vanessa stepped up from the trenches of poverty and grief onto a world stage under the watchful eye of powerful leaders: government ministers, foreign ambassadors, and United Nations staff. She was chosen from many outstanding high school students in Zimbabwe to address these high-ranking officials. In Zimbabwe, many children are battered and bruised in the wake of an economy destroyed by political difficulties and mismanagement. Orphans especially are left by the roadside of life, while children in families at least receive parental protection and care. In a country with a population of 1.26 million, 140,000 children are orphaned; 100,000 orphaned by AIDS (Source: Unicef report, 2009 & 2010). Zimbabwe’s cultural values are such that extended relatives are often motivated to provide an “inn” of refuge for orphans. But with an 80% unemployment rate, severe poverty prevents many from embracing these children. Hope’s Promise Country Coordinator, Lydia, and her husband Paul could not pass by without doing something. After years of personally caring for orphans, they inspired other volunteers to organize in service to vulnerable children, registering in Zimbabwe in 2009 as the Compassionate Volunteer Foundation (CVF). CVF was founded to supplement the resources of extended relatives, assisting with tuition, groceries, and emotional support, so that they could provide a loving home for an orphan relative. In early 2012, after realizing a shared vision and passion, CVF and Hope’s Promise merged and Hope’s Promise Zimbabwe LEADS program was born. Hope’s Promise LEADS, Leadership through Education, Accountability, Determination, and Spiritual Growth, is a sponsorship program that allows children to receive an education while remaining in the care of a relative. Hope’s Promise tries as much as possible to assist without disturbing existing family structures, working directly with caregivers and remaining all but invisible to the children so that their relationship is strengthened with the caregiver instead of an outside organization. Currently in Zimbabwe 8 orphans are cared for by extended family members under the covering of Hope’s Promise Zimbabwe LEADS program. Learn more about Hope’s Promise Zimbabwe orphan education sponsorships here.